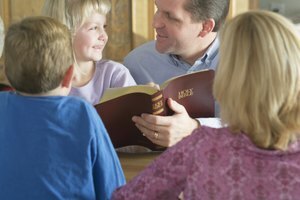 Children frequently learn about the Fruit of the Holy Spirit at Sunday school. The Bible is a Christian's guide to life that comprises history, rules of conduct and words of encouragement and comfort. Galatians 5 outlines characteristics that should be present in a person's life if he is serving the Lord. 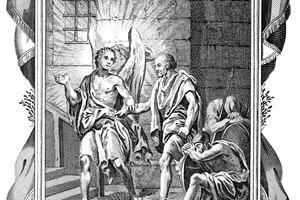 These characteristics -- referred to as Fruit of the Holy Spirit -- are love, joy, peace, patience, kindness, goodness, faithfulness, gentleness and self-control. It's important for children to learn and comprehend these characteristics at a young age. This knowledge will not only give them an indication of positive traits to look for in other people, but also gives them goals and structure of what fruits they should bear. 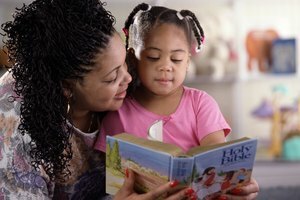 Use these activities to teach children about the Fruit of the Holy Spirit. Create a paper maze where the child must guide his pencil from the start of the maze to the end. Have the words denoting Fruit of the Holy Spirit attributes written along the pathway and tell kids they must find their way through the maze by following the words of attributes in the order that they appear in the Bible (the maze will be created this way), and that they cannot cross any lines. Crossword puzzles and word finds can also be created on this topic. Alternatively, have each child silently choose one of the Fruit of the Holy Spirit traits. 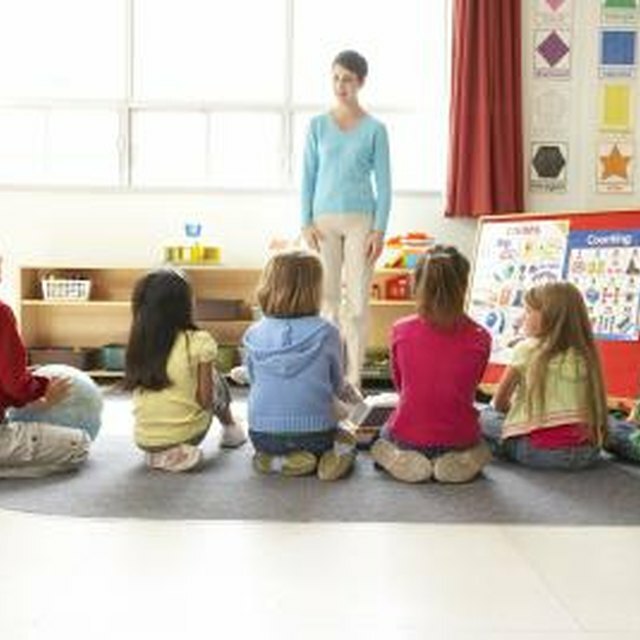 One child stands in the middle of a circle of seated students and calls out an attribute. Any seated student who chose that particular trait must get up from his chair and try to find an empty chair while the child who was standing in the middle looks for an empty chair as well. There are no winners or losers; the game ends when the teacher or an adult decides to end it. Use hands-on activities that help children remember and comprehend the nine Christian attributes. Draw and cut out a tree from construction paper. A brown paper trunk and green top look good on a light blue background. 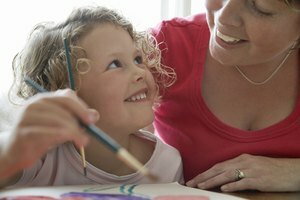 Have younger children draw a small, simple picture that represents a Fruit of the Spirit to them. For instance, for love, a child may draw a heart; for joy, he may draw a smiley face. Cut and glue each of these pictures onto the tree as if they were fruit growing on the tree. Older children can draw a tree with real fruit on the tree. Ask them to describe how a particular fruit of the Spirit is similar to a specific real fruit. For instance, a student can draw a picture of a strawberry, which she can say represents "love" because it is red and shaped like a heart. A banana can be the fruit she chooses to represent "joy" because yellow is a happy color and shaped like a smile. Participating in theatrical performances can teach children a lot. Not only are participants required to memorize lines, but they may also be involved in creating visual elements such as props and set design. Produce a skit about the Fruit of the Holy Spirit to perform during worship service. Young students can wear costumes that resemble fruit or wear fruit-colored T-shirts. The narrator can read scripture from Galatians about the Fruit of the Holy Spirit attributes and the children can say, in unison, the specific characteristics -- such as love or joy -- when the narrator directs them to do so. Alternatively, create a puppet play on the Christian attributes, using paper finger puppets that loop around the base of the fingers, and a makeshift stage from a shoebox. Give children seeds and help them plant them. Explain that by learning about God, reading the Bible and trying to live a life pleasing to Christ, the Holy Spirit will plant the seed of joy and happiness and other fruit in your life. Allow children to observe the slow process it takes to grow seeds and let them know that the same is true for spiritual fruit, which doesn't sprout over night. Help the children care for their seeds and let them know that just as seeds need soil, water and sunlight to grow and flourish, their spiritual seeds need nourishing. Teach them that children need to pray, read the Bible and listen to God to become Christian adults. Open and honest discussion about the Fruit of the Holy Spirit is another way to help students understand the concept. Use real-life examples of people displaying certain Christian attributes to illustrate the topic. For instance, if a student holds the door for a classmate trailing behind him, say that the courteous student displayed kindness. Kelley, Stephanie. "Activities to Teach Kids About the Fruit of the Holy Spirit." Synonym, https://classroom.synonym.com/activities-kids-fruit-holy-spirit-8322629.html. Accessed 18 April 2019.